Fathers are a girl’s first love and a boy’s first idol. It takes a very special man to be a dad and for that very reason, they deserve the best on Father’s Day and every single day. I know it’s sometimes hard finding the perfect gift to show how much you care about him, especially if he’s the guy who has everything! Here’s a guide that can help you find that gift that is right just for the type of dad he is! Plus, did you know that 60% of Father’s Day purchases are made 1 week before the big day–so don’t feel bad about shopping last-minute! So, what does dad really want for Father’s Day? 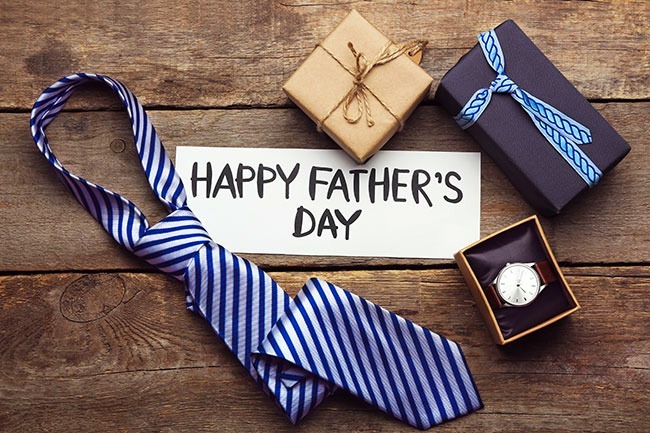 A recent survey conducted by Sears says that more than one-third of Canadian dads (36 per cent) agreed the number one gift they would most like to receive for Father’s Day is fashion-related. Some have their eyes on a new suit, perfect shirt and tie that fits just right or they may be after a new pair of kicks, either a pair of sneakers or trendy boat shoes. That only means one thing, maybe giving dad a stylish new tie or a pair of socks that make a statement may not be a bad idea–fashion dad is here to stay! Sears has done a bit of digging and research and discovered that predominantly Four Key Dad Personas exist and have created fully shoppable gift guides, available in-store and online, at Sears.ca/LoveYourDad just for them! A little more deets for you, 66% of dads in Quebec and Atlantic Canada want outdoor goodies they can’t do without, like BBQs, patio sets and fire pits. Who can blame them? He excels at manning the grill and you will enjoy a new patio set by a fire pit, right? 37 % of dads in Atlantic Canada say they’d like to receive tools, a lawn mower, shed, workshop or automotive accessories. A whopping 90% of Canadian dads say that spending time with family on Father’s Day is what means most and is most important. Closely following behind was getting gifts, hanging out with friends or relaxing by himself. We all need a little RnR! Below are my top picks for every type of Dad, any of these gifts will make them happy! Well, backyard dad is always on the move, he is a busy body and you might hear the lawn mower early in the morning as he is getting his lawn just right. Later, you’ll find him donning his King of the BBQ or Kiss the Cook apron while grilling up THE perfect steak (I’ll take mine medium,) or veggie kabobs for the fam jam. In fact, 36 per cent of dads claim that on a typical weekend afternoon, you will find him firing up the grill. Have a grilling king? Here’s his top picks to enjoy his outdoor zen! 1) CRAFTSMAN C3 19.2 Volt Lithium-ion ½-in. Brushless Drill Driver $149.99; 2) Broil King Premium Rib Rack $47.97; 3) Napoleon Travel Q Portable Propane Grill $219.99; 4) Earthwise 20” 3-in-1 Corded Electric Mower $229.99; 5) Earthwise 1500 PSI Electric Pressure Washer $119.99. When he’s not scouring Instagram for his next foodie hidden gem in the next city he is going to or staking out his next gourmet donut joint; he’s at home making cauliflower-crust pizza or your favorite, open-faced smashed avocado toast. Don’t worry, he’ll even top yours with tomato and bacon. Bacon makes everything better! Make Foodie Dad happy with these connoisseur-approved gifts. Gastronome approved. 1) Hamilton Beach Dual Zone 3-in-1 Griddle $71.99; 2) Henckels H.I. Classic 6-Piece Steak Knife Set $49.99; 3) T-Fal 2-Pack Pizza Pans$13.99; 4) KitchenAid Stainless Steel 10-Piece Cookware Set $479.99. Ahh, there’s something about a dad bod that is, well, irresistible. No matter what shape or form, we love them! You might find him on YouTube, scoping out the newest work-outs, new and healthy recipes to get him lean or the latest trends that will help him get fit! You can help him with his gains by getting him these gifts! 1) Juice Bullet $79.97; 2) Saucony Men’s Mystic Running Shoes $49.99; 3) NordicTrack C 600 2.6-CHP Treadmill $699.99; 4) Champion Men’s Power Train T-Shirt $25.00; 5) No.99 Wayne Gretzky Men’s Body Mapping Performance Golf Shirt $29.99. The modern dad has style, he can be like Harvey Specter during the week but, super casual with cargo shorts, plaid button-down shirt and loafers on the weekend. He isn’t afraid to try the latest styles or trends and he looks good doing it. Keep him stylish with these gifts! 1) No.99 Wayne Gretzky Dobby Stripe Pants $29.99; 2) Point Zero Men’s Cotton-Linen Short-Sleeve Shirt $29.99; 3) Clarks Men’s Fallston Style Lace-Up Leather Shoes $59.99; 4) Point Zero Men’s Cotton-Lined Cargo Shorts $29.99; 5) No.99 Wayne Gretzky Men’s Cotton Check Shirt $24.99; 6) KGB Duffle$24.99. To celebrate all dads out there, one lucky Whispered Inspirations reader will WIN a $50 Sears Gift Card. This contest opens on June 17th, 2016 and ends on July 2nd, 2016. It is open to Canada only! There you have it folks, you are now armed with tons of gift ideas for whichever type of Dad that holds your heart! It’s still not too late and you can either shop online or in-store at Sears.ca/loveyourdad! Make sure to follow @SearsCA using #LoveYourDad and like Sears Canada on FB for the latest updates! What are you getting the dad in your life this year? My hubby is a Modern Dad. I always end up getting him new clothes. This Father’s Day it’ll be new shoes. I would probably get my Dad a couple new shirts from Sears, he likes their clothing. My dad always says there isnt anything he needs.. So instead I get him stuff he enjoys. Lije pies, dutch licorice, treats he will be happy with on Fathers Day. My dad would be the backyard dad! My dad is a backyard dad for sure. He loves spending time outside and cooking up new home projects. My dad is the foodie dad, he loves to cook and fancies himself a chef! Foodie dad!! He would love a new set of pots and pans!!! My husband is backyard dad all the way. My dad was a total backyard dad and my husband is a modern dad. My Dad is a Foodie Dad. Loves to barbecue or eat is fancy restaurants! My dad is the foodie dad! I have a foodie dad.
. Thank you for the awesomeness, the contest, and generosity. 🙂 Pick me. My husband is the backyard dad. Thanks for the chance. My dad is definitely a backyard dad. He loves his outdoor gadgets! Hubby is the Backyard Dad as he is always pottering around the garden! Hubby is a backyard dad. I think Backyard Dad would be the closest to what my Dad is. I would get him some new summer shirts. My Dad is definitely a foodie dad! He is the Backyard dad, but more the golfing dad! My dad is a backyard dad! I aspire to be half the man my dad is. That will still make me twice the man of most. My dad would be closest to the foodie dad. My dad is a foodie dad. I would get my dad some handyman tools,as he is always doing or fixing something! My Dad is definitely Backyard Dad! He loves mowing his lawn, leaf-blowing, weed whacking, etc. He would get a lot of use out of the Earthwise pressure washer for his outdoor needs! The dad in my life is my husband and he is the Backyard Dad! My husband is the Dad Bod . He has started running again and is getting very fit. When he was a younger man he was the backyard dad for sure. My Dad, definitely the backyard dad, camping, barbecuing all that fun stuff! My dad is definitely the backyard dad! He is a modern kind of dad. I would probably use the gc to get him some new shoes. I would probably get him a couple shirts if I won since he loves the clothes from Sears. I would buy some nice cologne. My father was the backyard dad type. My father is a Foodie Dad! I would buy him some new shirts for work, and perhaps some shorts. My Dad is a modern dad. He loves to travel to new places and try new things. My Dad was definitely the Backyard Dad! He loved the yard to be well maintained and he loved to BBQ too! My husband is the foodie dad. He loves to cook! 100% Backyard Dad. No question. I often get my dad a new shirt. I would get my dad some new sweaters and casual khaki pants. My dad is a Backyard dad for sure! Definitely he is the Foodie Dad. Seriously, this guy loves to cook. How lucky am I? I would buy my dad a Juice Bullet. He wants to get into juicing so this would be the perfect gift for him from Sears. My dad is a backyard dad.. He is always working around the house and loves to sit back and relax on the deck! My dad was the backyard dad!! I would get him a power tool as he’s a woodworker. I would buy him shirts. He is an easy going guy, so he wouldn’t mind what I get him. i got my dad a gift certificate to his fav store! My father was the backyard dad! My dad would be the back-yard dad! I would get my husband some new sandals. My dad would be a foodie dad. I would get him a couple shirts, he always likes new ones. I got my husband an insulated, bag with a built-in speaker. My Dad is a Foodie Dad! my dad hearts the backyard…a pressure washer would definitely come in handy with all the dirty jobs that he has to deal with!! I would get my stepdad a nice dress shirt. The foodie dad would be the closest. Hubby needs some new socks so that would be another options of what to buy. My hubby is a Modern Dad. My father was the backyard type dad. The dad in my life loves watches. He likes any brand, but they have to be colorful! my dad is the quintessential backyard dad! My dad is definety the outdoorsy type therefor the present for the backyard dad would be more suitable. I definitely have a backyard dad! He loves doing things in the yard. He is a foodie dad. I would say the Back Yard Dad would describe my husband. He would be a Backyard Dad! My dad is more the backyard dad with a bit of the foodie dad mixed in there. We got a backyard Dad and if the weather would warm up and stop the rain and fog he could get out . I have a Dad Bod; I would get him a Fit Bit or a similar activity tracker. My dad is the outdoorsy backyard dad! My dad was the kind of dad that made me always feel loved. my husband would be the back yard dad or the foodie dad! The foodie dad resembles mine the most. Dad was saying he wants some new shorts so maybe a couple pairs of them! My Dad is totally a foodie dad! My father was a backyard dad. We have a Backyard Daddy in our home ! My dad is a backyard type of dad. My dad would LOVE a new BBQ as a gift! My Dad is a bit of mixture of the types above; I would get him a new laptop bag. My dad is a backyard dad. My hub is a stylish Daddy! I would get him some high quality undies from Sears! New power tools would be great. My dad always likes when I get him a bunch of fancy beers that he can try out! My dad is the Foodie Dad for sure! I would get him a watch. Maybe a new shirt and a pair of shorts. I have a Dad who is also a Foodie; I would likely get him some updated BBQ equipment/tools. My dad is 100% a back-yard dad! I would something for his woodworking shop. I would get him some new clothes. My dad is definitely backyard dad. I would get him a new power drill. My father was a backyard dad type of guy. I would get him a new pair of comfy slippers. I would get some merino wool socks to get his feet warm and toasty. I have a backyard dad! Some accessories for his car. Mine is a foodie dad. My Dad is a backyard Dad, so gardening tools would be great! He likes new clothes so probably would get him a summer outfit. My son in law is for sure a back yard Dad. I got him a drone.He likes interesting big boy toys. I have a Foodie Dad (although he is a composition of a lot of traits); I would get him a new pepper mill. At our home we have the Backyard Dad!! My Dad is a Foodie Dad. He loves to BarBeQue, not just the usual BBQ fare of steaks and burgers but also things like blueberry cornbread, rotisserie turkey for Thanksgiving and Christmas, and grilled pineapple upside down cake for dessert. My Dad is 92 and my Step-Mom is 93. Both are fairly independent, , but cooking has lost their interest. We given them gift certificates for the restaurant in their residence. A backyard dad he is. Always repairing or building to keep everything looking neat and tidy. My son in law would really love some new tools!! Backyard Dad would be the closest to what he is but even it is not 100%. I have a backyard type of dad! My son in law would love some new Nikes.